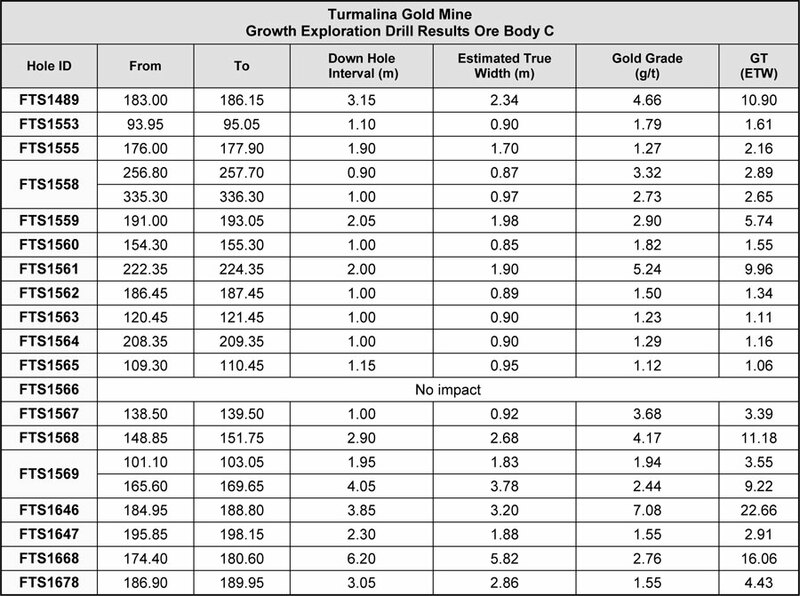 Jaguar Mining Turmalina Exploration Results Extend Orebody C Down Plunge and Laterally Along Strike, Updates Infill Drilling | Jaguar Mining Inc.
Toronto, February 27, 2019 - Jaguar Mining Inc. ("Jaguar" or the "Company") (TSX: JAG) today announced drilling results from 19 holes over 4,523m as part of its growth exploration drill program on Orebody C, and 46 holes over 4,708m from infill drilling (39 holes at C-SE and 7 holes at C-Central) completed since June 2018 (Refer News Release February 26 and June 18, 2018) at Turmalina Gold Mine (“Turmalina”). The growth drilling focused on targeting Orebody C extensions down plunge and laterally along strike, and to upgrade mineral resources to mineral reserves. “The recent high-grade intercept on orebody C-Central with a grade x thickness value > 150 GM is encouraging as we begin to evaluate previously under-tested areas assuming the newly identified plunge control. This work is being prioritized as any increase in grade, tonnes and ounces per vertical meter added in shallow areas of the mine may leverage access from existing infrastructure and provide more flexibility in the mine plan and ultimately potential for higher production”. Figure 1. 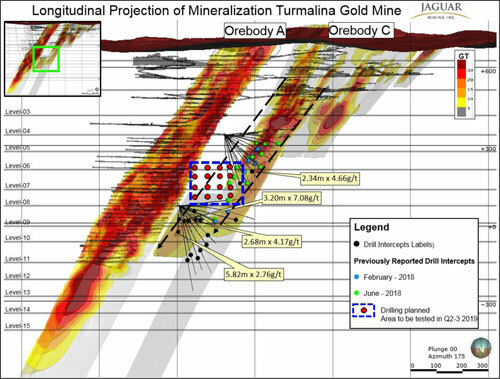 Long Section of Turmalina mine and with Grade x Thickness projection and the location of the growth exploration and infill drilling programmes completed to date. 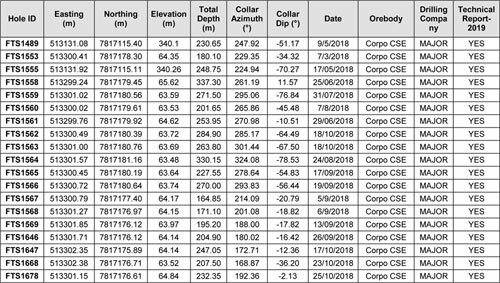 Please also note the new plunge direction relative to that previously used showing the plunge control to high grade ore shoots on Orebody C now approximating the plunge for the high-grade portion of Orebody A. Growth exploration drilling, targeting down dip extensions from level 4, continues to confirm the structure hosting Orebody C extends to depth beyond mine level 8 approximately 500m down plunge and 400m vertically from current operations. 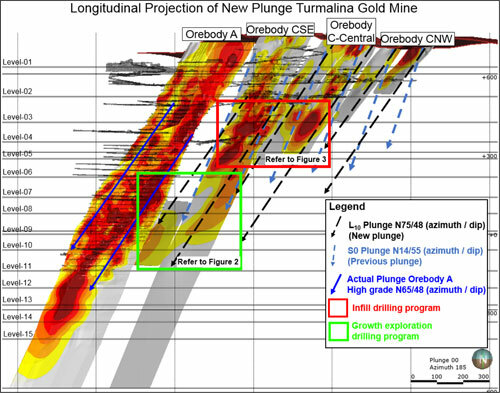 Importantly, this drilling successfully tested and confirmed the changes in the plunge direction of the higher-grade ore shoot highlighted by earlier drilling and subsequently geologically - structurally mapped in the mine development on levels 3 and 4 in Q3-2018 (Refer June 18, 2018 news release). The new plunge direction assumed is N75/48 (azimuth / dip) (previous N45/55). This high-grade plunge direction approximates the observed Orebody A high-grade zone plunge of N65/48. Further drilling is planned for Q2 and Q3 2019 to fully test this ore-shoot between level 4 and level 8 once a new drilling platform has been prepared for this purpose from the C-ramp on level 5. (Refer figure 2). Infill drilling on Orebody C focusing on upgrading mineral resources to mineral reserves between levels 3 and 5 was prioritized in Q3 and Q4 to inform the Mineral Resources and Mineral Reserves update during March 2019. This infill drilling continued to define wide; high-grade intercepts consistent with those previously reported (Refer news releases dated June18, 2018 and February 26, 2018). In the results released today 19 intersections with a grade x thickness of > 10 GM including 15 intersections with grade x thickness > 25 GM, 5 intersections with grade x thickness > 50 GM and 3 intersections with grade x thickness > 100 GM. (Refer figure 3, table 2). The observed change in the plunge control of the higher grade and wider parts of the Orebody Host Structure has positive implications for interpreting and targeting additional shallow mineralization further along the strike of the Orebody C structure where clear potential exists for the identification and delineation of additional high grade shoots below the C-Central and C-NW open pits. 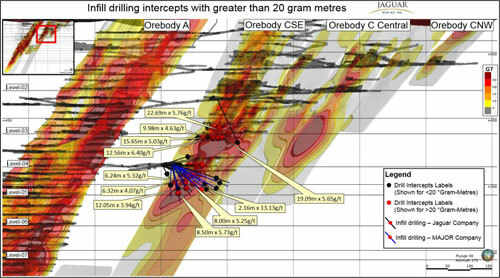 Results are reported from 8 infill holes targeting Orebody C-Central along strike from Orebody C-SE (using the mine drill rig) drilled as part of an ongoing drilling programme testing the potential for additional shallow, structurally controlled “payshoots” associated with the new plunge interpretation. Two higher grade intersections are reported from this drilling completed to date; 18.35 g/t Au over 8.76m (ETW 8.23m) and 9.95g/t Au over 2.29m (ETW 2.0m). These two holes define a high-grade plunging mineralized shoot, which extends over a strike length currently estimated to be of the order of 50m in this area. Further drilling and evaluation work targeting Orebodies C - Central and C-NW is in progress with the aim of identifying and delineating mineable material close to existing development that is currently within 150m on Orebody C-SE level 4. (Refer figure 4 and table 2). Of Note, results and data from 18 infill drill holes out of the 46 infill drill hole results included in this report were drilled after the database closed for the estimation at the end of 2018 Mineral Resources and Mineral Reserves. The hole numbers and coordinate data for these 18 holes are included in Appendix 2. Figure 2. Location of Growth Exploration Drilling Intersections - Orebody C-SE on Grade x Thickness projection. Please note holes drilled early in the programme that drilled outside the newly identified plunge controlling the high grade, wider parts of the targeted Orebody C Structure. Subsequent holes targeting the new plunge direction intersected higher-grade mineralization. The area between level 8 and level 5 that remains untested will be drilled once a drilling site has been prepared off the C - Ramp on level 5 for this purpose. 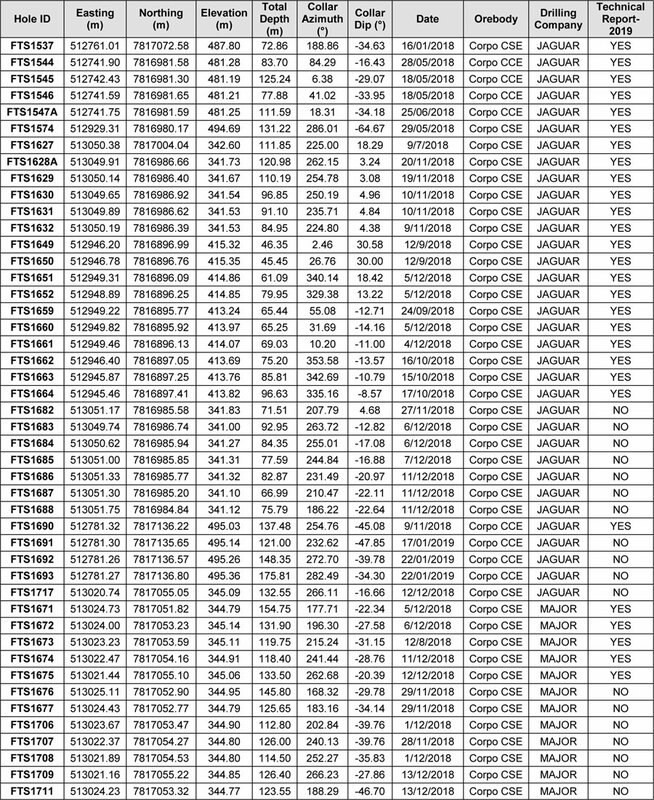 Please note assay results reported in the figure below were analyzed at the ALS Laboratory. Please note assay results reported in the tabulation below were analyzed at Jaguar’s Caeté Laboratory. 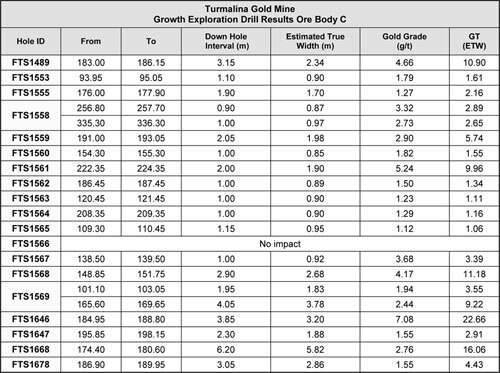 Please note assay results reported in the figure below were analyzed at Jaguar´s Caeté Laboratory. Scientific and technical information contained in this press release has been reviewed and approved by Jonathan Victor Hill, BSc (Hons) (Economic Geology - UCT), FAUSIMM, Senior Expert Advisor Geology and Exploration to the Jaguar Mining Management Committee, who is also an employee of Jaguar Mining Inc., and is a “qualified person” as defined by National Instrument 43-101 - Standards of Disclosure for Mineral Projects (“NI 43-101”). HQ, NQ, and BQ size drill core is sawn in half with a diamond saw. Samples are selected for analysis in standard intervals according to geological characteristics such as lithology and hydrothermal alteration. 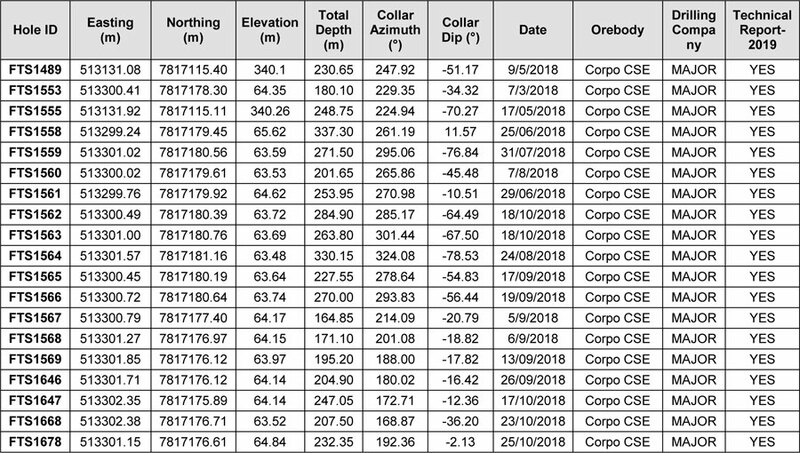 All diamond drill hole collars are accurately surveyed using a Total Station instrument and down-hole deviations are surveyed using non-magnetic equipment (SPT Stockholm Precision Tools with GyroMaster™ Solid State North Seeker) and a Reflex Gyrosmart 642. Half of the sawed sample is forwarded to the analytical laboratory for analysis while the remaining half of the core is stored in a secure location. The drill core samples from growth exploration drillholes are transported in securely sealed bags and sent for physical preparation to the independent ALS Brazil (subsidiary of ALS Global) laboratory located in Vespasiano, Minas Gerais, Brazil. The analysis is conducted at ALS Global’s respective facilities (fire assay are conducted by ALS Global in Lima, Peru, and multi-elementary analysis are conducted by ALS Global in Vancouver, Canada). ALS has accreditation in a global management system that meets all requirements of international standards ISO/IEC 17025:2005 and ISO 9001:2015. All major ALS geochemistry analytical laboratories are accredited to ISO/IEC 17025:2005 for specific analytical procedures. The infill drilling results presented on this news release are from drill holes completed by both Major Drilling on contract and Jaguar Mining Inc´s own drilling machines. The infill samples are transported for physical preparation and analysis in securely sealed bags to the Jaguar in-house laboratory located at the Roça Grande Mine, Caeté, Minas Gerais. For a complete description of Jaguar’s sample preparation, analytical methods and QA/QC procedures, please refer to the “Technical Report on the Roça Grande and Pilar Operations, Minas Gerais State, Brazil”, a copy of which is available on the Company’s SEDAR profile at www.sedar.com. The Iron Quadrangle has been an area of mineral exploration dating back to the 16th century. The discovery in 1699-1701 of gold contaminated with iron and platinum-group metals in the southeastern corner of the Iron Quadrangle gave rise to the name of the town Ouro Preto (Black Gold). The Iron Quadrangle contains world-class multi-million-ounce gold deposits such as Morro Velho, Cuiabá, and São Bento. Jaguar holds the second largest gold land position of a gold producer in the Iron Quadrangle with just over 25,000 hectares. 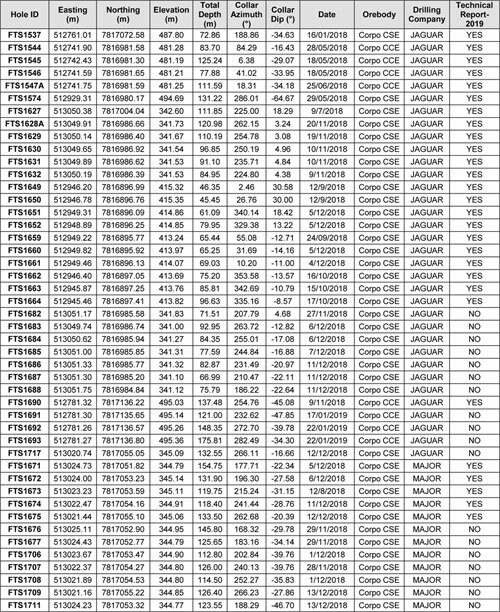 Drill Hole location data for holes reported in this Press-Release - Orebody C Growth Exploration Drilling. 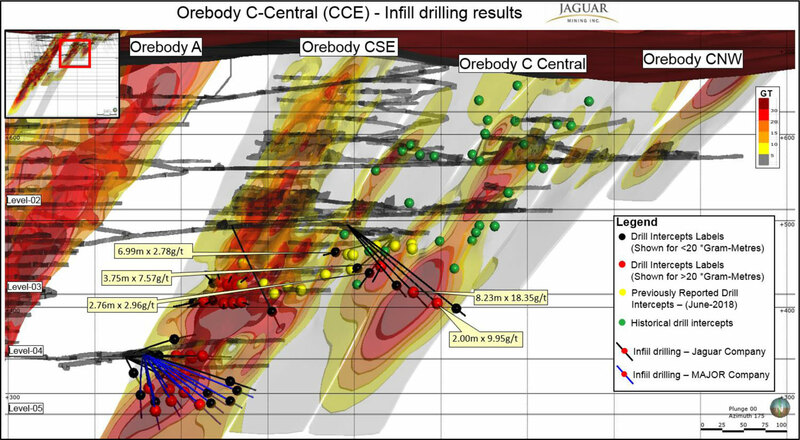 Drill Hole location data for holes reported in this Press-Release Infill Drilling Orebody C (C-SE and C-CENTRAL).